Abiquiu Realty, Ltd. was founded by Qualifying Broker, Ann McDaniel in 1991 to serve the needs of residents of Northern New Mexico and those who wish to be residents of this very special area of the world. Her particular brand of ‘touring the north’ is legendary among those who have purchased and sold property with her assistance over the years. When she began her career in real estate in 1986, she knew she had found her niche. 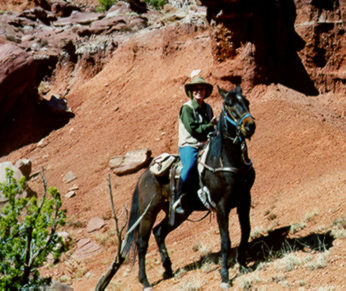 Having come to New Mexico in 1974, she has accumulated 39 years of knowledge and expertise of land in the north, which make her uniquely qualified to meet the needs of her clients, both buyers and sellers. A distinctive warmth that Ann brings to her business relationships has caused her clients, customers and associates to become great friends with her over the years. Ann raised her four children, Tim, Chris, Joey and Katie in Northern New Mexico. They are all now grown. Son Tim and his wife, Nadine, have given ‘Granny Annie’ two brilliant and beautiful grandchildren, Diego and Alia, in whom she will likely instill her love of the land.